Join us November 15th at 2:00 pm at Hometown Hobbies in Huntington for #2-19: Shades of Ice—Part III: Keep of the Huscarl King. This is for levels 1-5. Information in the Shadow Lodge headquarters in Whitethrone leads you into the Realm of the Mammoth Lords in search of an abandoned tower of a lost Ulfen king. The powerful weapon rumored to be there could be disastrous if it falls into the hands of those who plot the Pathfinder Society’s destruction; who will find it first? 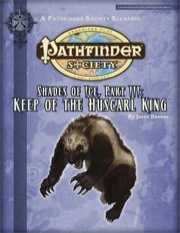 Keep of the Huscarl King is part three of the three-part Shades of Ice campaign arc.